Nalini Sriharan, a life convict in the Rajiv Gandhi assassination case, has been on a hunger strike in the Special Prison for Women in Vellore since Saturday seeking the release of all seven convicts in the case. Her protest comes five months after the Tamil Nadu cabinet recommended the release of the seven life convicts in the Raj Gandhi assassination case to Governor Banwarilal Purohit. Speaking to TNM, Radhakrishnan, her lawyer said that the delay in acting on the Tamil Nadu cabinet recommendation is worrying. “Though the hunger strike is against prison rules, in Nalini’s case it is completely justified. She is expressing her protest against the inordinate delay caused by the Tamil Nadu Governor in signing the release papers despite the TN cabinet approving it,” he said. Adding that the Governor was acting against the Constitution of the country and also against the oath of office he took, Radhakrishnan said that a petition will soon be filed in the court to seek resolution on the issue. 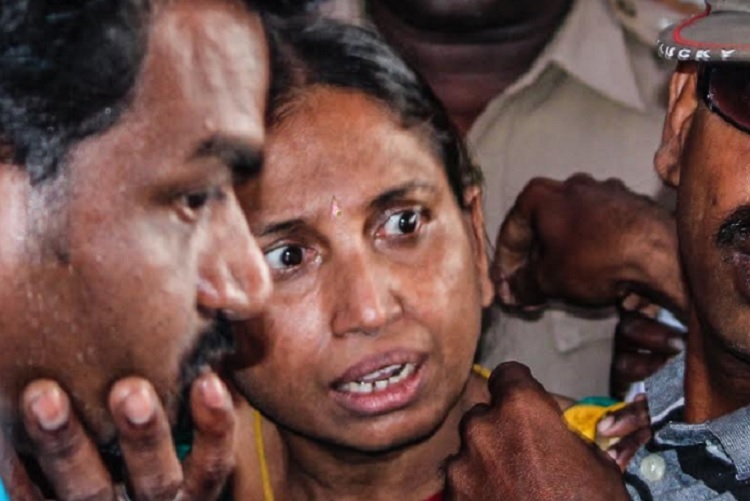 Her hunger strike also comes in support of a similar indefinite fast by her husband Murugan, who began his strike at the Vellore Central Prison on February 2 seeking their premature release. The Tamil Nadu government had in September last year recommended that all seven convicts in the Rajiv Gandhi assassination case be released under Article 161 of the Constitution. All seven convicts — Nalini, Perarivalan, Murugan, Santhan, Robert Payas, Jayakumar and Ravichandran — have spent 27 years in prison till date. Article 161 gives the governors of the state the power to grant pardons and suspend, remit or commute sentences. In August 2018, one of the convicts Perarivalan had told the Supreme Court that no action had been taken on his mercy petition filed before the Governor of Tamil Nadu. Meanwhile, the BJP-led central government did not agree to their release and informed the court that it would set a ‘dangerous precendent’ and have ‘international ramifications’. Former Prime Minister Rajiv Gandhi was killed on May 21, 1991 in Sriperumbudur near Chennai during an election rally. He was assassinated by a suicide-bomber Dhanu, who was part of the LTTE. The bomb blast claimed the lives of 15 others, apart from Rajiv Gandhi and injured 43. A Special Investigation Team was tasked with bringing the accused to book. Twenty-six accused were tried and sentenced to death by the trial court. However, in 1999 the Supreme Court released 19 of them and commuted the sentence to life imprisonment for three. It upheld the death penalty for Nalini, Murugan, Santhan and Perarivalan. In 2000, Tamil Nadu governor Fathima Beevi commuted Nalini’s death sentence to life. In 2014, the Supreme Court commuted the death sentence of three others owing to the inordinate delay in deciding their mercy petitions.